Please measure your waist with a tape measure (a bit loosely). Do NOT give us your pants size. 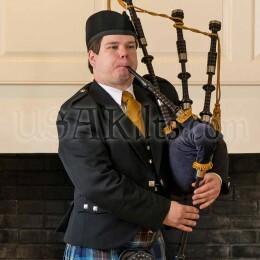 In highland wear, Irish customers often get the short end of the shillelagh with a bright green shamrock slapped on a Scottish sporran. 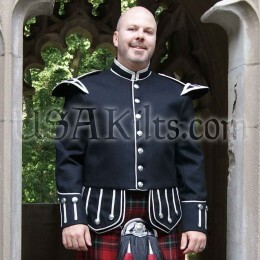 At USA Kilts, we wanted to change that. We designed a range of sporrans, from the ground up, with the Irish market in mind. 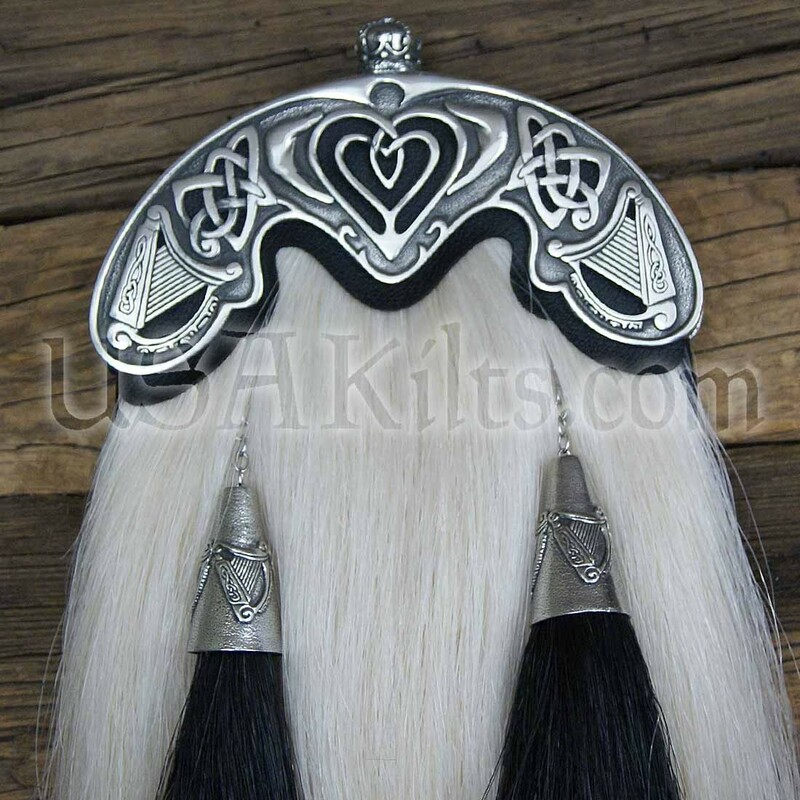 Our Irish Horsehair sporran is a USA Kilts exclusive, made by celtic artisans, to the highest standards. It features our private cantle design with hand sculpted claddagh, knot and harp artwork. Take a minute to look through the detail pictures of this cantle. The heart, harps and knot work all have cutaways to allow the leather underneath to show through. The traditional 'ball' of top of the cantle is replaced with a crown, completing the heart, hands and crown design of the claddagh. The harps flanking the claddagh are traditional Irish harps and the knotwork is inspired by the Book of Kells. But we didn't stop there... we've taken the details on this cantle to the next level. On the shoulder of the cantle, we've added small shamrocks and the cones on this sporran were cast with three small harps on each of them. This sporran has a functional pouch that is lined with suede and comes with our internal pocket design to hold your business cards / loose change and a sporran chain to fit the waist measurement provided. 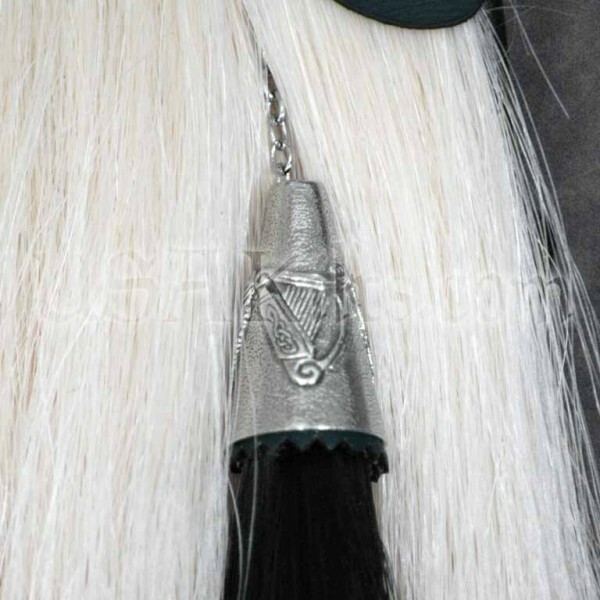 If you're looking to stand out as a piper and need an original horsehair sporran that exudes pride in your Irish heritage, look no further. The waist measurement needed is the actual waist measurement, not your pants size. Typically, your pants will be 2 to 4 inches smaller than your actual measured waist. The Sporran (Gaelic for "purse" or “Pouch”, pronounced /Spor' en/) is a pouch that performs the same function as pocket on the kilt. It's where the kilt wearer stores their keys, wallet, etc. The sporran hangs a few inches below the belt buckle (typically 3”), directly over the wearer's 'manhood'. Made of leather or fur (or a mixture of the 2), the ornamentation of the sporran is determined by the formality of dress worn with it. The sporran is worn on a leather strap or chain, or in the case of larger men, from 'sporran hangers' which suspend it from the belt. It is essentially a survival of the common European medieval belt-pouch, superseded elsewhere as clothing came to have pockets, but continuing in the Scottish Highlands because of the lack of these accessories in traditional dress. There are several types of sporrans. Day Sporrans, Semi Dress Sporrans and Dress Sporran are the most common styles. There are also other styles, including Hunting Sporrans, Full Mask (aka Head On) Sporrans and Horsehair Sporrans. Day sporrans are typically worn casually, during the day (before 6 PM). They are made from all leather and have a flap on the top. They are typically “D”shaped with the flat part at the top. Dress Sporrans are typically worn formally (after 6 and for formal events like weddings). 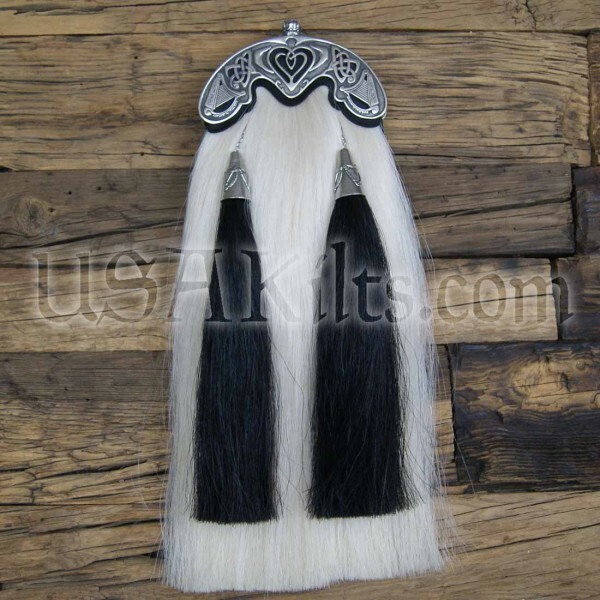 They are made from fur (Bovine is most common in the US) and have tassels on the front and have a metal cantle (semi circle of decorated metal at the top) on top. They are typically oval shaped and open in a “V” from the top. Semi Dress sporrans are a cross between the Dress sporran and the Day sporran. They are half leather (the flap that closes the top) and half fur (the front 'face' of the sporran). Typically they have 3 (and sometimes 2) tassels on the front. They are typically “D” shaped with the flat part at the top. While some consider them to be “a jack of all trades, master of none”, they can be worn to both formal and casual events. Hunting sporrans are a full leather sporran with no tassels on the front. They are preferred by many pipe bands for the lack of 'drumming' done while walking (no tassels = no drumming). While it's not clear where they acquired the name “Hunting Sporran”, it is generally accepted term that is meant to differentiate them from the typical “day sporran”. Full Mask sporrans are the fur sporrans which have the head stuffed and mounted on the flap. They can be worn formally and casually, though due to the price, most are reserved for formal occasions. 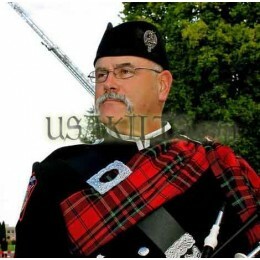 Horse Hair sporrans are most typically worn by pipe bands with a 'military' look. While they have been worn by civilians in years past (1800's), current fashion is to relegate them to pipe bands and military personnel. This sporran is a stock item available for immediate shipment. In the rare instance that we're caught between shipments, we will let you know within 24 hours.